Early indications were that the council vote today in Okotoks was not going to go well. Councillors Laurie Hodson and Stephen Clark were strong in their commitment to Okotoks’ sustainability model–a globally recognized, award-winning approach to community development based on the concept of “living within your means.” But both were worried and as we know now–outnumbered on town council. I’m guessing that Hodson was pacing late into the evening. He is the only councillor who was actually around when the sustainability concept was introduced more than a decade ago and had defended it passionately. The model was never about building walls around the community, as opponents liked to portray it, it was about ensuring the town had enough water before approving development. Seems like common sense, but you know what they say about common sense. As the council meeting approached, two key council members, Mayor Bill Robertson, and long-serving Councillor Ed Sands, were not saying which way they would vote. On the opposing side, Councillors Matt Rockley and Ray Watrin were sure to vote for both ditching the sustainability model and embracing the controversial water pipeline from the Bow River (to be built by the City of Calgary and of course, paid for by Okotoks tax dollars for years to come). Councillor Florence Christophers, who at first appeared in the community as an environmental champion, later joined forces with Rockley and Watkin (rounding out “team growth”). Today’s vote in favour of lifting the population cap, annexing land and embracing rampant growth is likely not a surprise to many residents. Council has always been conflicted when it comes to the international reputation of the community. With developers like Mike Holmes chomping at the bit to build hundreds of homes on the outskirts of town, “team growth” was salivating at the thought of bringing in more revenue for the municipality (and likely for some lucky landowners). Despite evidence that increased development brings increased infrastructure costs leading to a revenue-neutral outcome or worse–a deficit–the plan had always been to stall the Municipal District’s plans for homes on the outskirts of Okotoks, annex more land and then beat them at their own game. So, now, Okotoks and the Municipal District will be free to play Russian Roulette with the water supply (the province has shown little interest and is leaving it up to the Calgary Regional Partnership–the CRP– to sort out). Except the City of Calgary is in a conflict of interest when it comes to the water supply. They stand to gain financially from a water pipeline to surrounding communities. They also enjoy significant control over the CRP and although Premier Redford promised on the campaign trail to eliminate Calgary’s veto power over decision-making, there has been no indication of any follow-through on that promise. Who knows what will happen next? Team growth is likely celebrating their victory. They haven’t had many over the last few years. Okotokians have demonstrated time and again that they have a better grasp of what’s important than their politicians. Every community survey has overwhelmingly supported the retention of the sustainability model and keeping growth capped. And yet, council voted today to go against the wishes of the citizens. Politicians giving voters the shaft? Not possible! What is truly bizarre is the contradictory stance of Mayor Robertson and Councillor Ed Sands. They voted in favour of annexation but rejected the water pipeline. 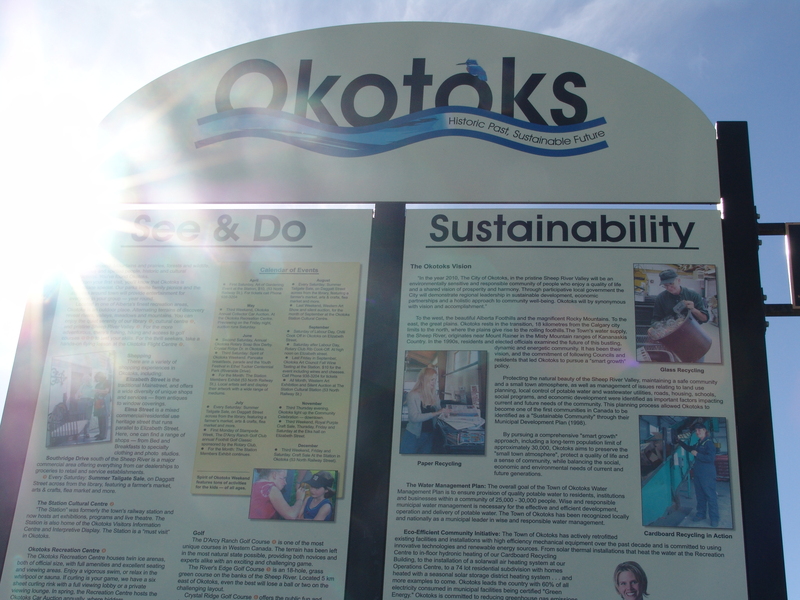 This isn’t just a rejection of Okotoks’ sustainability premise, it’s a slap in its face. Their vote says they understand the least about the situation of anyone. At least Rockley, Watrin and Christophers voted for the hugely unpopular water pipeline (likely at their political peril once Okotokians realize what this means to their pocketbooks). At least they understand you can’t have development without water, however ill-conceived and poorly thought-out their solution may be (we don’t actually know whether the Bow can support the growth that this type of unleashed development will bring). But Robertson and Sands seem to have not been paying attention AT ALL. They voted for development first and effectively said, “we’ll worry about where the water is going to come from later.” Right. This is what got us in trouble in the first place–ignoring reality until your back is up against a wall. You need water to develop communities. You need water to live. Today, Okotoks town council failed to honour its citizens’ wishes. Those who voted for continued growth in the face of significant evidence of water shortages are leading the community down a dangerous path–one that leads to greed and obscurity for the once celebrated town. Knowing how incredibly unsustainable growth in Alberta has been so far, it’s perhaps too much to hope for that this vote will come with any of the enlightenment that might make it possible. Our developments are incredibly wasteful of water. Ideas like rain water harvesting, grey water systems, composting toilets, and xeriscaping could be used to facilitate some growth, if the population of the province is going to grow anyway. I believe that the proposed development by Mike Holmes included some of these measures. Of course the real problem is that Alberta’s economy is firmly entrenched in our existing economic model, which needs economic growth to be considered healthy. Until we fix that, the notion of anything else being sustainable is pretty much futile. So true @johnny. We are stuck in the paradigm that growth is always positive and absolutely inevitable. Therefore, we can’t think of moving forward any other way. There are some visionary folks like Eben Fodor (Better Not Bigger) who have tried to change attitudes about what constitutes a robust community but we have a long way to go. Asking people to change their way of thinking is never easy. Oddly enough, I find Okotokians more willing than most to embrace this new concept, but unfortunately, their politicians (with the exceptions noted above in my post) are not leading but lagging behind, stuck in a traditional mindset.